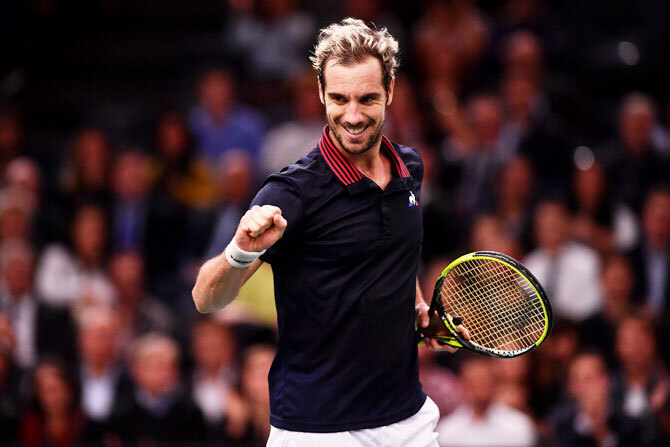 Home favourite Richard Gasquet punished an erratic display from Canadian teenager Denis Shapovalov to progress to the second round of the Paris Masters on Monday with a 6-4, 7-6 (3) victory. Shapovalov made a brisk start and raced to a 3-0 lead before Gasquet responded with a mix of aggressive backhands and clever drop shots to reel off five consecutive games. The 19-year-old Canadian struggled to settle into a serving rhythm as he made 18 unforced errors, including five double faults, allowing Gasquet to clinch the opening set in 44 minutes. Having tightened up his game, Shapovalov roared back in the second set with a string of powerful groundstrokes but Gasquet recovered from 4-1 down to level at 4-4. Gasquet, ranked 28th in the world, held his serve to force a tiebreak and kept his composure to prevail on the first match point. Earlier in the day, Russian power-hitter Karen Khachanov began his campaign with a 7-5 6-2 win over last year's runner-up Filip Krajinovic. Khachanov, who lifted the Kremlin Cup earlier this month, recovered from a 3-5 down and saved a set point to battle past his Serbian opponent in 75 minutes.